It’s late July and the heat is here, on and around the Missouri River. With temps reaching the upper 90s and even into the 100s for the last few weeks, our water temps have been on the rise. With that being said, start your days early! 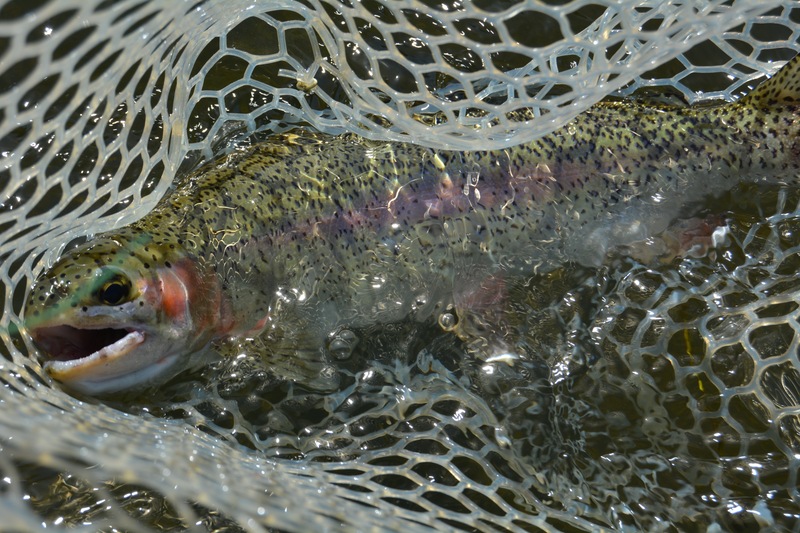 The fishing has been great in the morning, then tapering off in the afternoons, then picking back up in the evenings. As we walk into the shop in the morning, PMDs still dominate the mayflies attached to the door, but as we look down at the Craig bridge, Trico clouds swarm the entire length of the bridge itself. This has been creating some great fishing in the morning, both subsurface and on top! During the heat of the day, things have slowed up a bit, but that doesn’t mean you won’t still catch fish. The caddis take over the river in the late afternoon into the evening and temps typically cool down just a bit, because of this, the fish start getting more active again. Focus on PMD and Trico nymphs in the morning, as well as midge patterns. Our rental boats have been coated in midges upon their return. Psycho Mays, Green Machines, and Military Mays in size 16 and 18 have been great top flies in the morning, with size 20 dark colored Green Machines and Military Mays as bottom flies. Once the afternoon hits, switch over to caddis nymphs such as Bloom’s Weight flies, Sparkle Caddis Pupas, Tung Darts, Deep Six, and Bird Nests. Always be on the look out for those pods of noses, morning and evening. In the morning throw Hi-Vis Trico spinners, Cluster Midges (can be used as both a midge and a trico cluster), and trail a drowned trico, a small dark Green Machine, a small Mac Gruber, and even a Love Bug. Then in the evening, throw Corn Fed Caddis, Double Duck Caddis, Stocking Wing Caddis, and Silverman’s Extended Body Caddis. Fish early or fish late, bring plenty of sunscreen and water! Tight Lines.